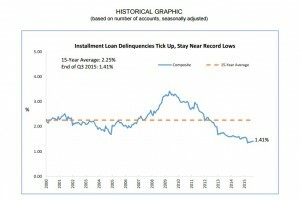 Delinquencies in closed-end loans rose slightly in the third quarter of 2015 amid slower economic growth, according to the ABA Consumer Credit Delinquency Bulletin released today. according to the ABA Consumer Credit Delinquency Bulletin released today. The report noted an uptick in delinquencies for six out of 11 individual loan categories. The composite ratio, which tracks delinquencies in eight closed-end installment loan ca tegories, rose 0.05 percent to 1.41 percent of all accounts — 0.1 percent below the composite ratio from the third quarter of 2014 and well below the 15-year average of 2.25 percent. Delinquencies in two of the three home-related categories — home equity lines of credit and improvement loans — trended downward, falling to 1.31 percent and 0.87 percent, respectively. Delinquencies for home equity loans rose one basis point to 2.91 percent. “The economy remains positive even though its momentum slipped a little in the third quarter,” said ABA Chief Economist James Chessen. “Slower job and household income growth made for fewer improvements in delinquency rates. 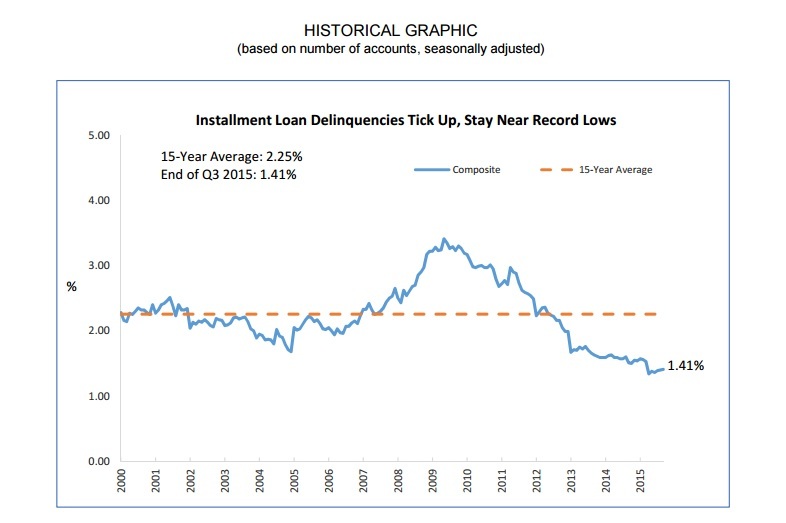 Fortunately, consumers remained disciplined in managing their debts, which has kept delinquencies close to historical lows.” Chessen added that he anticipates delinquencies to remain near historically low levels for the foreseeable future, as they follow the lead of the economy.